W.W.S.J.D. 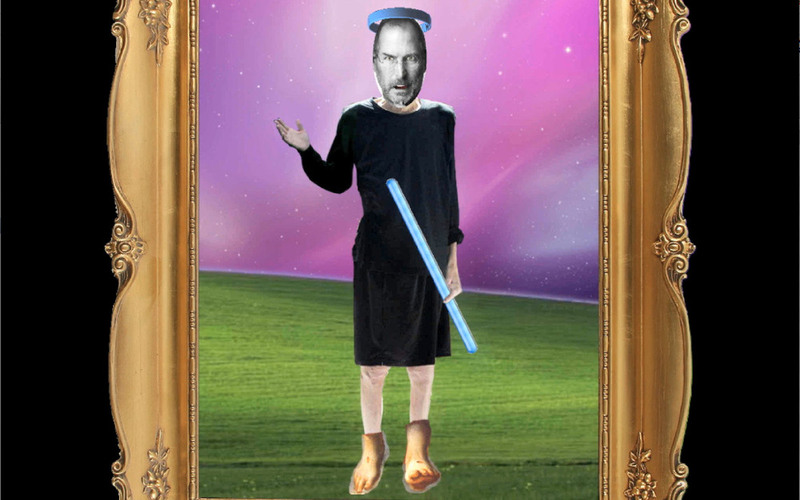 (What Would Saint Jobs Do) is reactionary work inspired by consecutively sad technology news events of summer 2011. The first one being the exit of my favorite Apple user interface element, the Aqua Scrollbar from Mac OS X software as it transitioned from version 10.6 "Snow Leopard" to version 10.7 "Lion". The second hard news event was Steve Jobs' retirement announcement and the subsequent reports and photos of him in his ailing health. As both an Apple Fanboy and a critic of Apple Fanboy culture, I felt strongly apprehensive that Steve Jobs was dying and with his exit from life we were pre-emptively losing the candy-themed impact on computer and software design that defined Apple during the first decade of the 21st century. This piece playfully but earnestly mourned these losses while highlighting the spiritual value given by many to Jobs' genius and entrepreneurship. The work premiered at Montréal's Bring Your Own Beamer event at the Centre for Canadian Architecture on September 10th, 2011. Steve Jobs passed away less than a month later.